In 2013 the Institute of Medicine (IOM) Roundtable on Population Health Improvement organized a workshop to discuss opportunities to foster a health in all policies approach in non-health sectors such as housing, transportation, defense, education, and others. Much of the discussion focused on public-sector organizations, and roundtable members saw the need for further discussion of the role of the private sector, both as stakeholder and partner. 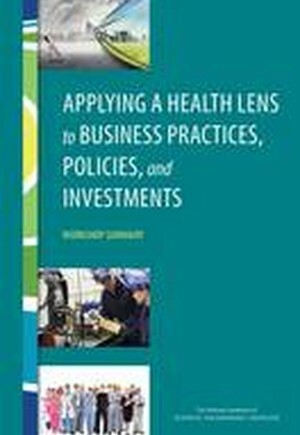 On June 4, 2015, the roundtable convened a follow-up workshop focused on applying a health lens to the role and potential of businesses in improving economic well-being and community health outcomes. Participants explored what businesses can offer the movement to improve population health and areas of potential, as well as models for how businesses can impact the determinants of health, and developed a platform for discussing how to promote and support health in all business practices, policies, and investments. This report summarizes the presentations and discussions from the workshop.